What are macadamia nuts good for? Macadamia nuts are high in healthy fats and may help those trying to lose weight. One serving of macadamia nuts also contains dietary fiber, protein, manganese, thiamin, and a good amount of copper. The fat content of macadamia nuts is higher than that of other popular nuts such as almonds, cashews, and walnuts. A 1-ounce (oz) serving of macadamia nuts has 21 grams (g) of total fat. More than 75 percent of the fat that macadamia nuts contains is monounsaturated fat, which has health benefits. These nuts also contain specific kinds of monounsaturated fatty acids (MUFAs), which are not readily available in many other foods. 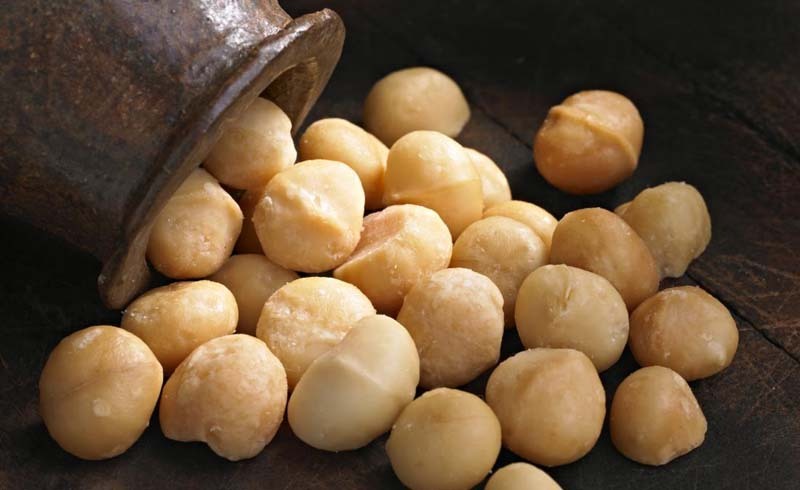 Macadamia nuts contain just over 1 g of natural sugar, and they are a low glycemic index food. With their many health benefits, macadamia nuts can fit into any healthful diet. The Centers for Disease Control and Prevention (CDC) say that heart disease causes 1 in every 4 deaths in the United States. It is the leading cause of death for both males and females, responsible for the deaths of around 610,000 people each year. Studies have found that eating tree nuts, including macadamia nuts, can lower the risk factors for heart disease. For example, a 2007 study in males with high cholesterol found that after 4 weeks of eating macadamia nuts, they had lower risk factors for coronary artery disease. In 2015, a research review found that eating tree nuts of any type lowered total cholesterol, low-density lipoprotein, or "bad," cholesterol, and triglycerides. Replacing saturated fats with monounsaturated and polyunsaturated fats such as those present in nuts raises levels of high-density lipoprotein (HDL), or "good," cholesterol, according to some studies. Another long-term study in people from Sweden found that consuming nuts may be linked with a lower risk of atrial fibrillation and heart failure. Metabolic syndrome is a group of conditions that can increase the risk of diabetes, stroke, and heart disease. Metabolic syndrome includes high blood pressure, high blood sugar, low levels of HDL cholesterol, high triglycerides, and excess belly fat. The American Heart Association (AHA) say that about 34 percent of adults in the U.S. have metabolic syndrome. The rates are increasing across the world. Some research suggests that MUFAs, such as those present in macadamia nuts, may help lower the risk of metabolic syndrome or reduce its effects in people who already have it. A research review from 2016 shows that eating a diet high in MUFAs can reduce metabolic risk factors in people with type 2 diabetes. HbA1c is an important measurement for people with diabetes. It is a person's average blood sugar level over the past 2–3 months. A study on rats with diabetes found that a diet high in MUFAs plus exercise was more effective at lowering HbA1c than either eating the fats or exercising alone. Another study shows that tree nuts such as macadamia nuts help improve glycemic control in people with type 2 diabetes. Macadamia nuts contain a type of vitamin E called tocotrienols. Tocotrienols may have powerful anticancer abilities, according to some research. 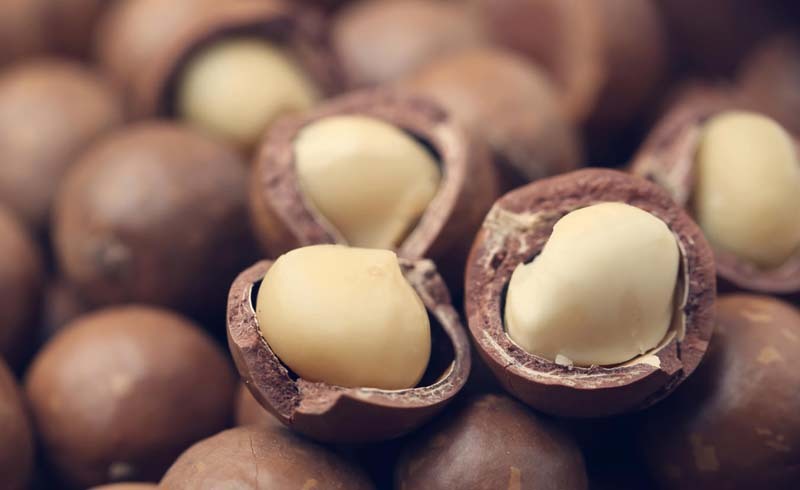 Macadamia nuts contain a significant amount of tocotrienols. Macadamia nuts also contain plant compounds called flavonoids, which can fight cancer by destroying damaging free radicals in the body. Aside from their potential ability to fight cancer, tocotrienols also have brain-protecting effects. One study found that a tocotrienol-rich supplement helps protect brain cells from the effects of glutamate, which may play a role in the development of Alzheimer's disease and Parkinson's disease. Another study on rats shows that oleic acid, one of the main monounsaturated fats present in macadamia nuts, can protect the brain from certain kinds of oxidative stress. Macadamia nuts and their oil are some of the richest sources of palmitoleic acid, a monounsaturated fat also called omega-7. Researchers in one study gave sheep palmitoleic acid for 28 days, and the results show a reduction in weight gain by 77 percent. However, experts have not yet shown that palmitoleic acid has weight loss benefits in humans. Another study shows that feeding mice macadamia nut oil as a supplement reduced the size of their fat cells after 12 weeks. Macadamia nuts contain protein, high amounts of beneficial fats, and fiber. Together, these nutrients can help a person feel full for longer. The fat takes longer to digest, and protein and fiber help prevent large blood sugar changes that can make a person feel hungry. One cup, or 132 g, of macadamia nuts contains nearly 950 calories. This might be half of a person's daily calorie needs or more. However, the standard serving size for macadamia nuts is 1 oz, or 28.4g, which is far less than 1 cup. A 1-oz serving is about 10–12 nuts and contains around 200 calories. Using a food scale or counting the nuts and eating only the allotted amount can help prevent accidental overeating. Eating macadamia nuts in place of other high-fat or high-calorie foods can provide their benefits without adding calories and fat to the diet. For instance, people can sprinkle a few macadamia nuts on a salad in place of bacon or croutons. Another option is to eat a serving as a snack in place of chips, cookies, or other processed foods that offer little nutrition. People can eat macadamia nuts raw or roasted. However, one study suggests that roasting macadamia nuts, especially at higher temperatures, can reduce their nutrient content. It may be best to consume raw or soaked macadamia nuts, or nuts roasted at a low temperature. Not all macadamia nuts are healthful choices. A person should look at the ingredients and choose types that contain only the nuts, and no sugar, salt, or added oil. Tree nut allergies are serious and can be life-threatening. Even inhaling tiny particles of nuts can be enough to trigger an allergic reaction in some people. Those with nut allergies need to avoid macadamia nuts completely. Those who live with a person who has nut allergies may also wish to steer clear of them. This is due to the risk of cross-contamination or accidentally exposing them to trace amounts of nuts. People who are not allergic to macadamia nuts can enjoy them daily. Research has shown that they can help protect the brain, lower the risk of heart disease, and stave off hunger, among other things. Some people use macadamia nut oil in cooking, as it is high in beneficial fats. It is also possible to use them in salads to replace higher-fat options such as croutons. However, a person should remember that they contain a high number of calories. Macadamia nuts are a whole food with plenty of good fats, vitamins, and minerals. They possess many health benefits that show promise. However, they are not a magic bullet for treating health conditions without making other complimentary lifestyle changes. U.S. Daily News: What are macadamia nuts good for?